The Heart Nebula is a large emission nebula in the constellation Cassiopeia. The beauty of this iconic astrophotography target is due to its mix of both bright pink hydrogen gas, and dark dust clouds. This glowing nebula get’s its nickname from the familiar shape it resembles and is located approximately 7,500 light years from Earth. The brightest portion of the nebula is cataloged as NGC 896, which is likely the first part of this nebula you will notice when photographing with a DSLR camera. The Heart Nebula contains a large area of gas that radiates from the open cluster (Melotte 15) at its core. 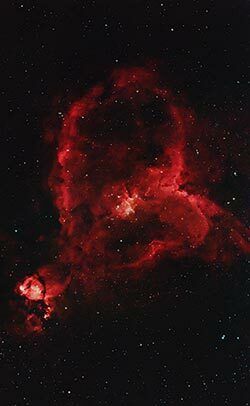 This deep sky object is also cataloged as Sharpless 2-190 (Sh2-190) and resides very close to the Soul Nebula. 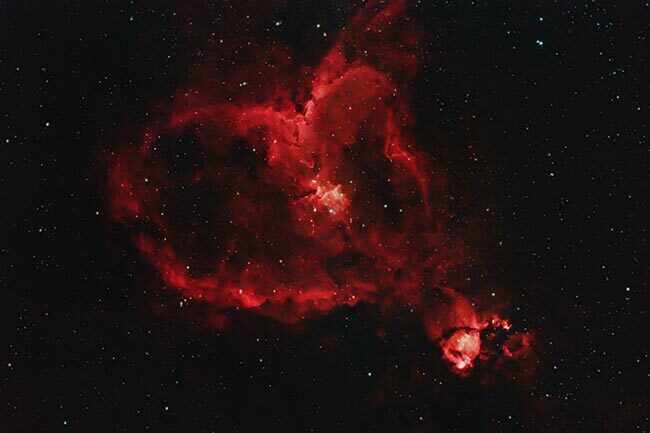 The Heart & Soul Nebula are often paired together in photographs using a camera lens. To capture both objects in the same field of view, expect to use a focal length of approximately 200mm. In September of 2017, I set up my iOptron SkyGuider Pro mount and pointed the telescope over the roof of my house, and towards the Heart Nebula. After a fair amount of time framing the object up just right, I was able to pour in over 5 hours worth of integrated exposure time. The camera used was a Canon EOS Rebel T3i that has been modified for astrophotography by removing the stock IR cut filter. 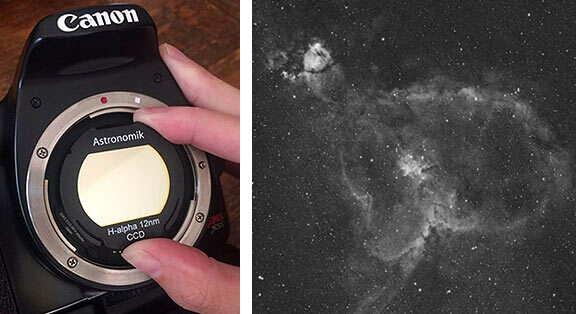 A modified DSLR is recommended when shooting hydrogen-rich emission nebulae such as the Heart Nebula. Processing the data captured using a stock DSLR camera will make pulling the bright red areas of the nebula quite challenging. The image below shows what you can expect to achieve when using a DSLR and telescope from light polluted skies. Taking the time to shoot calibration frames such as flat frames will make processing your image much easier. The image above was captured using a William Optics Z61 telescope. The Zenithstar 61 is an apochromatic doublet refractor, that requires a dedicated field flattener to produce images with sharp stars to the edge of the frame. This lightweight telescope specializes in wide-field astrophotography, and the Heart Nebula was the perfect DSO to showcase this quality. The image above includes exposures in both standard broadband RGB (true color) using a light pollution filter, and in h-alpha using a 12nm Astronomik narrowband Ha filter. 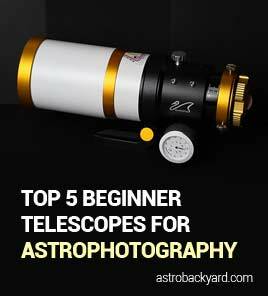 This is a superb way to maximize the details captured in your astrophotography images from the city. The h-alpha data creates a formidable luminance layer to boost the contrast of your final image. The complete astrophotography details including the camera settings and exposure times are listed below. The first image you see here was captured in true color (RGB) using a SkyTech CLS-CCD filter. The goal here is to retain the natural colors of the object and the surrounding stars for an accurate portrait of this nebula. 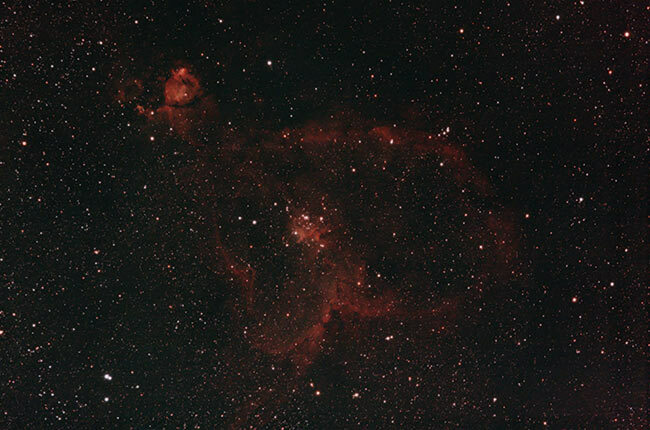 As you can see, the heart nebula is definitely there, but it lacks the rich detail and colors of my final image. Keep in mind, this is after soaking in over 3 hours worth of integration time with a modified DSLR. The SkyTech CLS-CCD light pollution filter does a good job at reducing the glow from the city, but not without its drawbacks. You may notice that the stars in the RGB image have a greenish hue, something that will need to be corrected in the final image. The lack of nebula structure in this image illustrates why I deem it necessary to include images using an H-Alpha filter for this target (at least from the city!). The Ha filter separates the hydrogen alpha from the stars and background sky – making a much more defined shape in your image. Now you can really start to see why they call it the Heart Nebula. 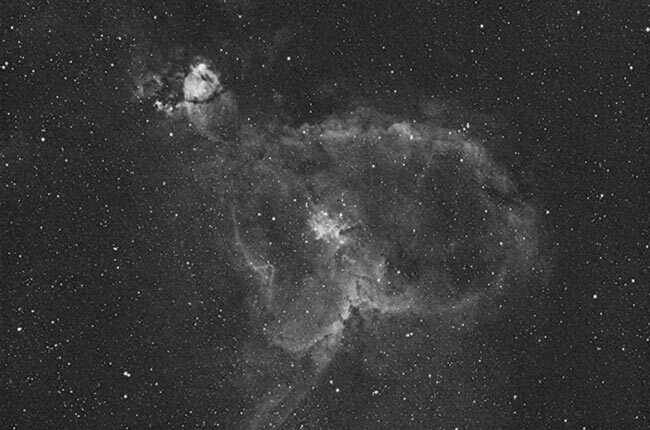 This version of the Heart Nebula is in grayscale, and can now be layered over top of the color version as a luminance layer. This image was photographed in my backyard using an extremely portable deep sky astrophotography kit. It excels at wide-field imaging and was used during a camping trip where I photographed the Andromeda Galaxy. 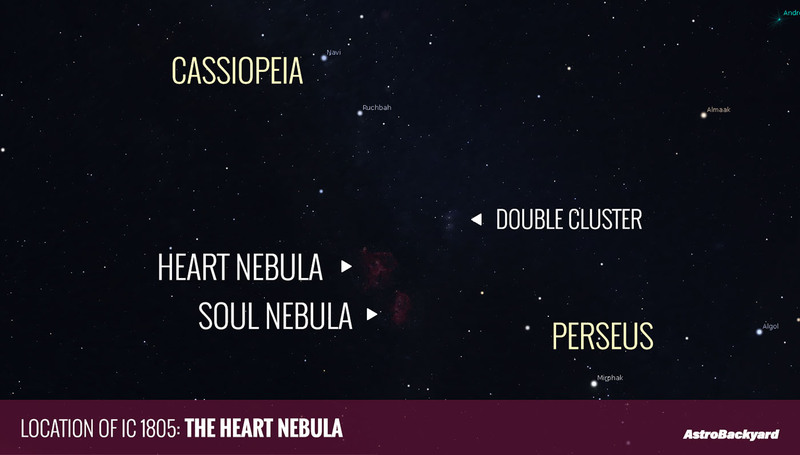 Where is the Heart Nebula Located? It is easy to find the Heart Nebula (and Soul Nebula) by using the constellation Cassiopeia as a reference. Cassiopeia contains many bright stars that can be identified even in bright suburban skies. IC 1805 and IC 1848 are located North of Perseus, and just to the left of the Double Cluster. Please see the star map below for reference. The use of reference images and framing of stars is helpful. I should also mention that this object is very large, almost the width of 5 full-moons! If your telescope has a long focal length, you may need to build your photo as a mosaic or use a camera lens to capture the entire nebula.